Trex Deck Lighting | International Wood Products, LLC. With Trex Deck Lighting, you can take your outdoor space from invisible to inviting. 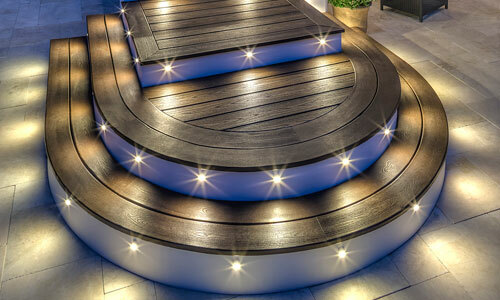 Lighting provides a soft glow that illuminates your deck for ambience and safety. Deck Lights can be installed into the railing, stair risers or the deck itself, and the Trex LightHub® connection system makes it easy! Whether safely illuminating your stairways with LED riser lights or proudly highlighting the perimeter of your domain with deck post lighting, Trex Deck Lights offer a long-lasting glow that makes your deck truly an outdoor living space. All deck lights are backed by a limited warranty. Trex covers the LED lights and housing for seven years of use.